Was the java.util.regex package based on Jakarta-ORO? A lot of Java libraries that need regex functionality, but also need to retain compatability across 1.3 and earlier VMs use the famous Jakarta ORO library. This is a great (and fully-featured) regex implementation. An example of a project that uses this is one of the projects that I am a committer on, Jakarta Commons-Net. This is a very popular library which is mainly used for its FTP functionality, e.g. Ant’s FTP task uses it as its FTP engine. However, it is designed to be compatible with 1.3 and earlier VMs. One of the implications of this is that its regex parsing is done by ORO, which necessitates extra “baggage” in the form of a separate jar download. As an exercise, I decided to see how easy it would be to convert the existing ORO code to a JDK-based approach. I first created a branch in SVN (here), and started to work on the ORO code. It turned out to be trivial to make the changes, in fact the APIs were so similar I have a strong feeling that the Sun engineers who implemented the java.util.regex package may have been heavily influenced by the design of the ORO interface. * @return true if s matches this object's regular expression. * @return the number of groups() in the internal MatchResult. One issue that can crop up during unit testing is problems with date mapping. In SQL terms dates to a “day” level of precision can be specified using a DATE column and dates with a “time” element can be mapped using a TIMESTAMP (or MySQL DATETIME) column. These map respectively to the Java SQL types java.sql.Date and java.sql.Timestamp. Note that a java.util.Date object can specify times, up to a millisecond level of precision, whereas a java.sql.Timestamp object can handle nanosecond-level precision. To conform with the definition of SQL DATE, the millisecond values wrapped by a java.sql.Date instance must be ‘normalized’ by setting the hours, minutes, seconds, and milliseconds to zero in the particular time zone with which the instance is associated. This means that any Date objects we retrieve from our Hibernate-mapped objects will have an effective time of midnight , i.e.something like 25-Jan-2006 00:00:00. We cannot just use the getTime() method to retrieve a long equaivalent of the date value either, as the they will ave the same problem. Now our asserts will pass without a problem. There’s an entertaining overview of the bigger picture here. 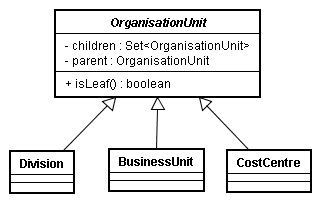 Quite frequently when building applications, you will come across the requirement to build a hierarchical tree structure of entities, for instance, an organisational hierarchy. This is elegantly represented by the composite design pattern. A further twist on this is creating persistent trees of objects. Here I show you how to achieve this with Hibernate 3 using the annotations package. In this case, PersistentTestCase is just a convenience class that extends JUnit’s TestCase class and adds support for the Open Session In View functionality provided by Spring. (UPDATE: there is a more up-to-date Spring Security example here: http://blog.mediasoft.be/?p=1). In the tradition of the NTLM-related posts that I have previously written (see here, here, here, here and here), I have a final installment concerning how to get NTLM authentication to work with Acegi Security. Acegi has provisional support for NTLM authentication (currently the support is not bundled with the distribution, it’s in CVS only), and there is an open ticket here tracking the progress of that feature. Hopefully it will be bundled with 1.0, but for now, you can just download the CVS source tree and build it. The underlying NTLM support is built on top of JCIFS, which I have written about previously. I will explain why we are using a custom provider later. Now that we have defined a protected resource, we need to provide an authorisation store. For this simple example, I will use an InMemoryDaoImpl. Note that you probably wouldn’t do this in real life – I haven’t even bothered to specify a passwordEncoder here. We also need to specify an access decision mechanism. In this case we will just use the vanilla unanimous voting mechanism. Read the Acegi docs for more details on this procedure. For now, we just need to know that it’s there. Refactor NtlmAuthenticationToken to extend UsernamePasswordAuthenticationToken. Implement the NullPasswordDaoAuthenticationProvider. I just copied the code for the existing DaoAuthenticationProvider and removed any logic in the additionalAuthenticationChecks() method. The reason for doing this is that by default, DaoAuthenticationProvider calls authentication.getCredentials(), which returns null in our case. Some of these changes may be due to the manner in which I implemented the demo (i.e using an InMemoryDaoImpl itself, and not broader issues. There dies seem to be a lot of configuration required, however once it is written, it works a treat. After having worked on an inhouse security framework in the past, I have vowed to to look at Acegi first from now on whenever this requirement arises in the future.